Over six million people have been killed in the Democratic Republic of Congo in the deadliest conflict since the Second World War. With Congo’s war showing no signs of abating, this would put the death toll at 6.9 million today. “Six million dead is a staggering figure that should jolt the international community into providing greater protection for Congo’s civilian population,” said Fr Pierre Cibambo, a Congolese priest who works at Caritas headquarters in the Vatican. “The last ten years has been a human tragedy on a vast scale, and sadly one the international community has closed its eyes too,” he said. In 2009, Caritas helped 400,000 people with emergencies relief including food, medicine, shelter and counseling Caritas is working at the national, regional and international level to work for peace in Congo. 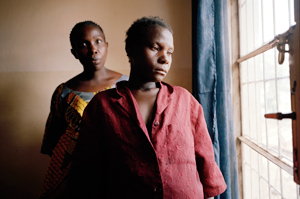 View a slideshow of six consequences of war in Congo. Caritas works in eastern Democratic Republic of Congo by providing humanitarian relief to victims of the conflict through Caritas Goma. Caritas is providing humanitarian relief for 12,000 families forced from their homes by ethnic conflict in the north west of the Democratic Republic of Congo (Congo DR). We asked Joseph Donnelly, Caritas Internationalis Permanent Delegate at the UN in New York, if the international community is closing its eyes to more than six million people have died as a result of the conflict in the Democratic Republic of Congo since 1998.